Here you will be able to find barrier tape and accessories for simple cordoning. You can pick from barrier tape in red/white or yellow/black - with standard lenghts of 500m. 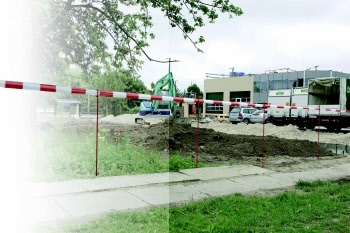 We have two different barrier tapes, a standard tape which is 0.032mm thick and a premium tape that is unbreakable with a thickness of 0.05mm. We also offer plastic tape with customized print. -If you are looking for a temporary cordoning, this is the cheapest option. -Complete with accessories like spears to fix on soft foundation or dispenser for easy handling. 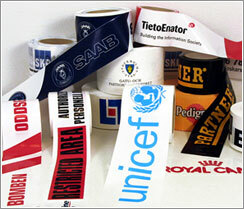 -Tailor-made barrier tape with your own print. Choose from 1-4 colors. -Delivery time about 20 days - ask for an offer for express delivery. In the picture above, our red/white standard plastic tape is beeing used with a metal spear to create a fixed cordoning. In the picture above you see an example of barrier tape with 1-3 color print.